HTC Hot Deals are back for this year’s hottest holiday – Valentine’s Day. Starting today through Friday, February 17, folks can pick up a number of HTC devices, all with big savings attached. As listed, you can grab a HTC 10 for $150 off ($549), One A9 for $200 off ($299), or a One M9 for $250 off ($399). On top of that, all accessories are 50% off, so long as you spend a $100 minimum. And for audio lovers, you can grab a set of JBL Reflect Aware C headphones for 50% off, bringing the total to just $99. 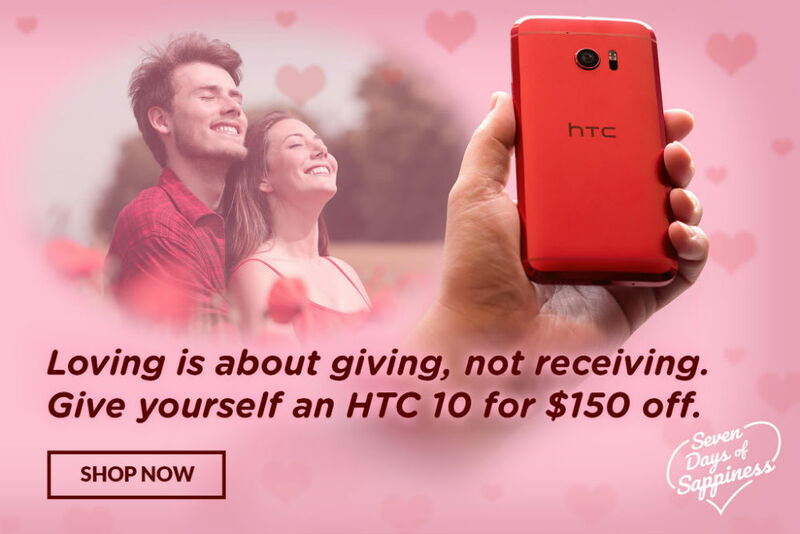 To go along with these deals, HTC also has a little V-Day promo. Every phone order will receive FREE shipping, FREE Uh Oh protection & a special Valentine’s Day gift (everyone will get a notepad or travel water mug PLUS a few lucky people will get power chargers & free phones) from HTC to show our love. If your romance calls for the metallic, smooth body of a HTC device, you are in luck. Follow the link below to check out the deals.